I am hoping to shake off the anesthesia haze and get back to having fun! On Friday, the day after surgery, I ventured out in a haze to the garage where a few guild members worked very hard on 2nd Time Around fabric prep while I looked on and cheered them on and answered questions. I was able to work through an entire box of “bundles”, counting pieces and getting them tagged and priced. In my post anesthesia haze I honestly had trouble with losing count, and devised a little “paper marker” for groups of 10’s. That worked and I was able to stop recounting, and move the bundles into the box! On Saturday one of my bee buddies came by for a visit and a cup of tea. Pam brought me 3 containers of wonderful homemade soups. That boosted me up too. Afterwards I wandered across the street to say hello to another guild member who had a cardio cath a few days earlier. I saw that she had her daughter and great grandson for a visit so did not stay but a minute. Since the weather was decent and I was “already across the road” I took advantage of her development’s quiet streets and had a nice long walk. By going up and down each street in the neighborhood I was able to get a mile walk in before heading home. On Monday my friend Nancy B. (also my co chair for 2nd Time Around) came over and she worked on organizing a bunch of the donations while I fiddled with some of the kits and got them priced up. Nancy is a great sorter, and cleared out a bunch of donations that will be moved along to the thrift shop. She has a good eye for things that won’t sell at the guild meeting and might do better elsewhere. Our stack of boxes ready for the April quilt show is growing quickly with beautiful fabrics to sell. I also had a visit from my “other friend” Nancy L, who delivered a wonderful ziti casserole on Monday afternoon. My hubby was pleased that he wouldn’t have to figure out dinner! We had gone to the supermarket on Sunday afternoon, and neither of us could even think of what we wanted to eat, so I grabbed a couple of “lean cuisine” style frozen meals and more fresh fruit. Gosh I am enjoying the ziti, and the big pan has lasted us several days. I have managed to make a b.l.t. sandwich once, so kitchen skills are coming. Tuesday I had a mid day appointment with the physical therapist. The surgeon had sent an order for a different splint. That visit was quite something. I didn’t realize she was going to completely remove the bandage and do wound care as well as making a customized splint. The area on my finger where the incisions were made is quite spectacular looking…..no photos as it was pretty unsettling if you aren’t used to seeing that sort of thing. Of course, I am curious by nature so I had to inspect the surgeons fine sewing!! My #1 complaint about the splint the surgeon put on is it did not protect the end of the finger and I had banged that end about once a day. There are stitches there where a screw was placed in my finger and it shrieks with pain if you bang it. I banged it about 20 minutes before leaving for the therapist, so I was at a 12 on a scale of 1-10. She offered to make a splint that would protect the end, and that made me very happy! She did a lot of measuring and checking range of motion and swelling and assigned me home work for the next 2 days. Thankfully, just the end joint is now immobilized, and I can bend at the knuckle. Gone is the huge dressing and wrap, but I still have to keep it dry for another week and a half. Apparently when I go twice a week to see the therapist, she will remove the bandaging and clean and redress it. I can feel that the swelling has gone down, and my new splint is much smaller. No more banging the end of the finger on stuff which is a huge improvement! The new splint has a velcro closure and I can actually tighten it if needed. My hand looks terrible with bruising down to the middle of the back of the hand, below the purple marker. At least I can use the wet wipes and clean the orange goo off the rest of my hands and nails. (At this point I still have to put it in a plastic bag when I shower. This is MUCH easier though. ) I go back in the morning for another round and hope she sees it has improved. After the visit to the therapist, hubby and I had a nice 1 1/2 mile walk and that really got my lungs cleared out and my brain fuzz and haze cleared up. Of course, I was invigorated by the walk and exhausted at the end. Seems that napping is still the daily priority. Hubby spent the day working in the garage and I hung out in the house. I really have been in a haze. We had a “snow storm” planned for the day, but it fizzled out and drizzled freezing rain for hours. When it finally stopped this evening, I was ready to get up and get moving! After he left for the train club tonight, I put on my shoes and went out to the sewing room. I didn’t have any plan but I was sick of hanging out in the house. 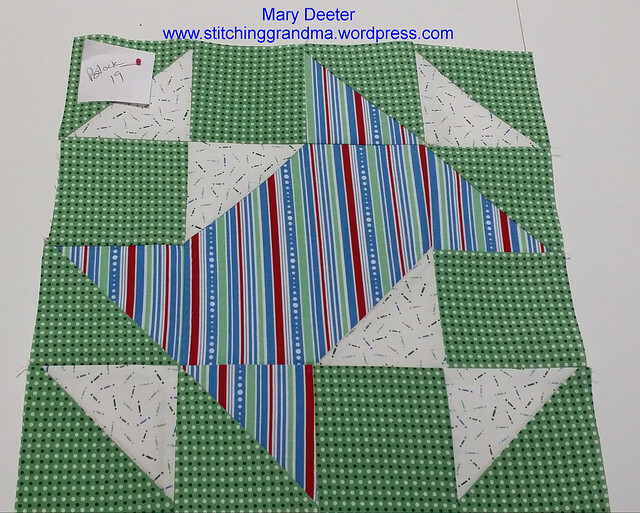 I took my cutting instructions out with me for the new From My Carolina Home mystery quilt. 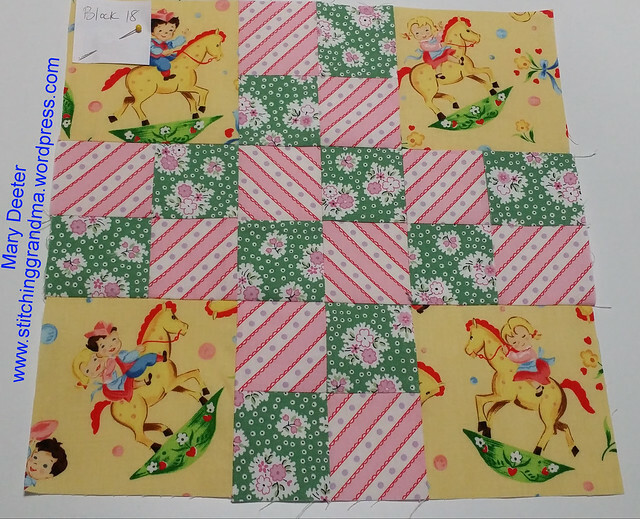 Nancy B. had given me some of the pieces already cut, and I got out my basket of 2.5″ squares and pulled a bunch more out. I reached into the scrap basket and pulled a bunch more bits of fabric out and tried my hand at the rotary cutter. Guess what? I CAN CUT! I use a FISKARS loop cutter, and I was able to hold it and cut my pieces. 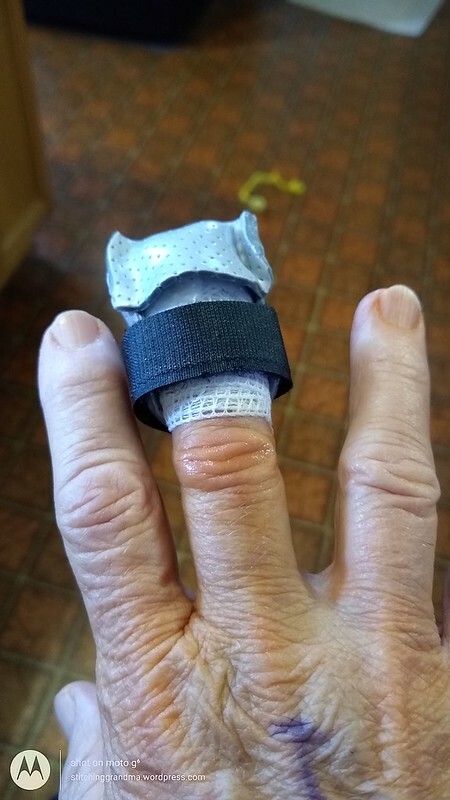 Because my splint is a hard molded plastic, I had no concerns about hurting my long finger, and it didn’t interfere with using the rotary cutter. Now, I don’t think i will be doing much cutting for a while, but I was pleased with getting all the pieces cut for the throw size project! I added to what Nancy B. had cut for me, and got the neutrals cut as well. It is not too late to join in. February instructions at the above link are all cutting. Very easy…even in my situation. Next set of instructions comes on the 2nd Friday of March, so still plenty of time to break out the scraps. Getting out there and just playing around a bit in my sewing room has helped me perk up. Now I am wondering if I can do any sewing? I have some binding made and a few placemats left to bind! Feeling better for having done something fun! The haze is blowing away. Now if the weather improves, maybe I can sneak out for another walk!!! My hubby said the anesthesia haze and the pain haze are helping me to rest but honestly….I would much rather go play! It takes me days to get that stuff out of my system. Tomorrow is a full week, and since I am not taking anything stronger than Ibuprofen, you can’t blame the drugs! Sewing will help!! So will more exercise! I also have some much loved “grandma time” scheduled for tomorrow, and that has to help! Everyday is an improvement and for that I am thankful. Are you playing along and doing the Scrap Dance ? How do you get out of a wintertime slump? Thankfully it wasn’t a rotary cutter accident! I am on hold for a while. No rotary cutting for 6-8 weeks. 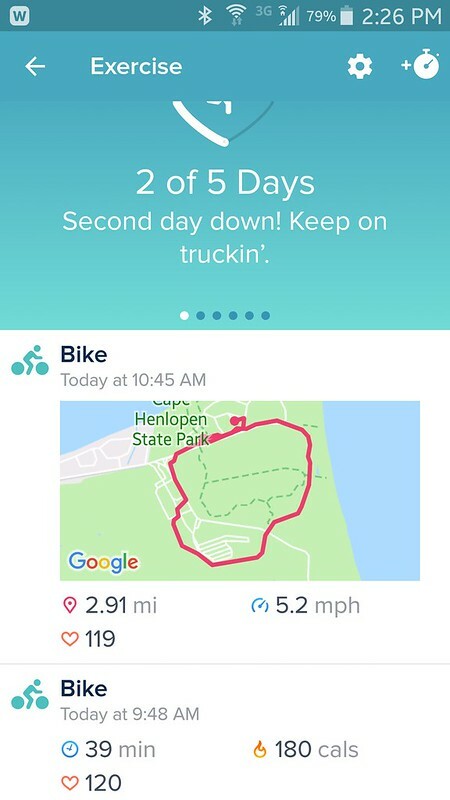 No bike riding for that same time period. Had surgery on my right long finger to repair an ongoing issue with polyarticular osteoarthritis. Not a lot of options for fixing it….. Arthritis Foundation gives a good description of those options. My best option was to fuse the joint. In quilters terms…sore twisting aching joint at the end of my finger near the nail. Got so I could not put any pressure on the end of the finger pad or touch anything without shooting pains. About August last year I finally gave up and went to see the hand specialist. 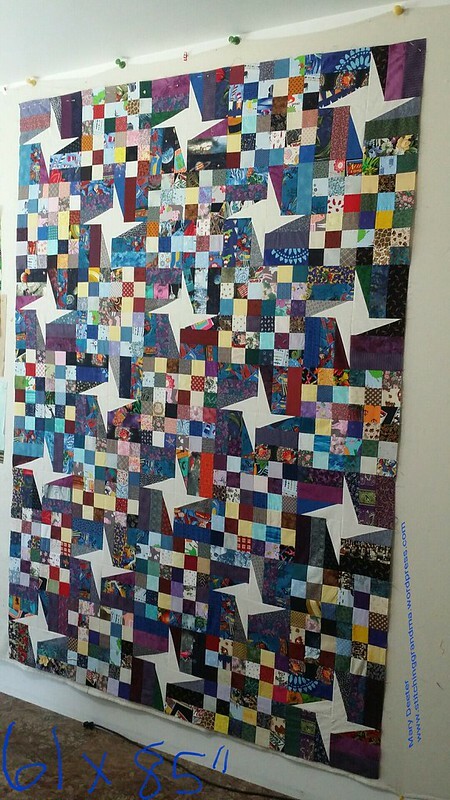 When your quilting life is impacted this way, it is time to throw in the towel. I just wanted him to wack the thing off…that is how bad it was. All the cartilage was gone and bone spurs were growing between the joints but twisting the end of the finger. 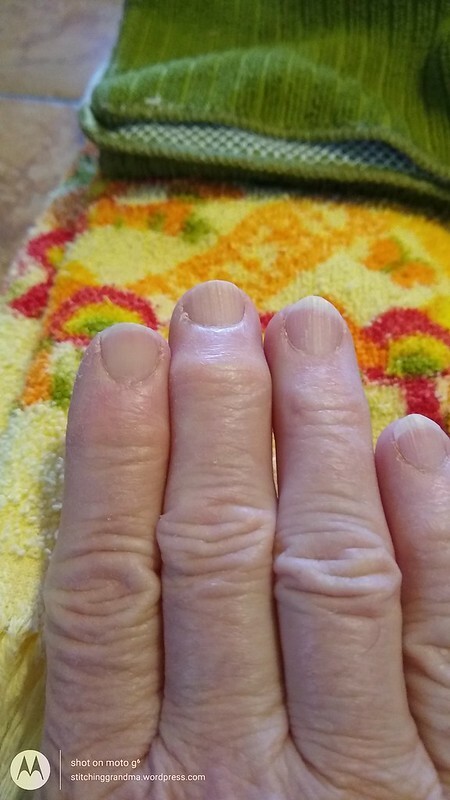 Well…he wouldn’t fix it until my trigger finger in that finger and the ring finger were fixed….so I had that procedure done in October and it was successful. (Another thing to slow me down!) I had to wait for full recovery, and 2 cruises, before I could get the joint repaired. Valentines Day my dear hubby had to get up at 4:45 am and take me to the hospital for outpatient surgery. I was in surgery by 7:15 am and recovery by 9:15. I really appreciated the 2 hour nap because I NEVER get very much sleep the night before. We were home before 10 am, and both of us napped off and on all day long in the family room recliners. Me more than him. He was dispatched to pick up medications and food! I will be dining left-handed for a long while, so food choices will be simple easy to prepare and easy to eat left-handed. (For example – No tacos because they take two hands…..). Here is the dilemma — the bandages stay on for 2 weeks. 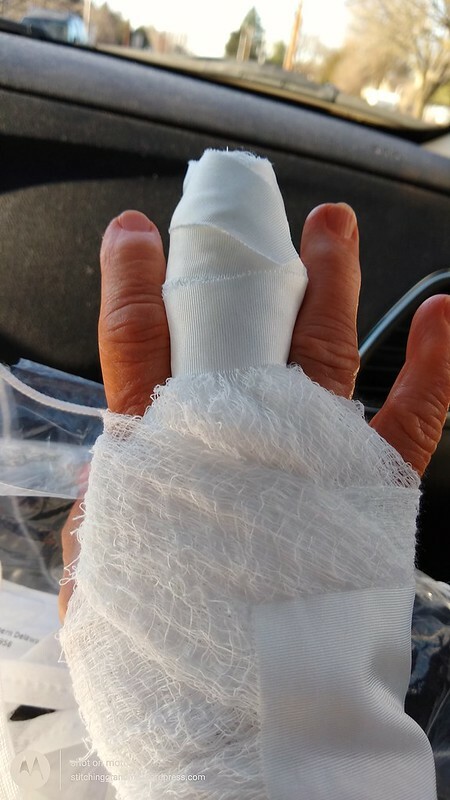 Nice pretty tape on the finger but cheesecloth like gauze for the hand. My surgery in October resulted in that gauze shredding in 3 days. My daughter who knits is creating a 1 finger glove….something I can wear but keep the splinted finger under cover and the bandages around my hand cleaner. In the meantime, a sock with the end cut open is helping. My lovely friends have been checking in on me and cheering me up. Sweet Pam delivered soup today and cookies and the Farmers Almanac. I’ve had fun reading bits of it this afternoon. Boredom has already set in, and I took a short walk today to clear the anesthesia haze from my brain, and to pop in on my neighbor Arlene. She is is recovery from her own medical adventures this week, and I was happy to see she wasn’t alone. Her daughter was there to keep her company! So, posting will be minimal for a while until this heals up. Frankly, not much sewing will be happening while that bone heals and fuses. I found out yesterday that I get a new splint on Tuesday, so maybe a reduction in bandages! It can only get better from here!! Hope your crafting is without interruptions. At our house, summer is always full of projects that will never end. Several years ago I spent the entire summer (it seemed) rebuilding a picket fence, sanding and staining fence pickets. Thinking back it was BEFORE I retired, so that was more than 6 summers ago. 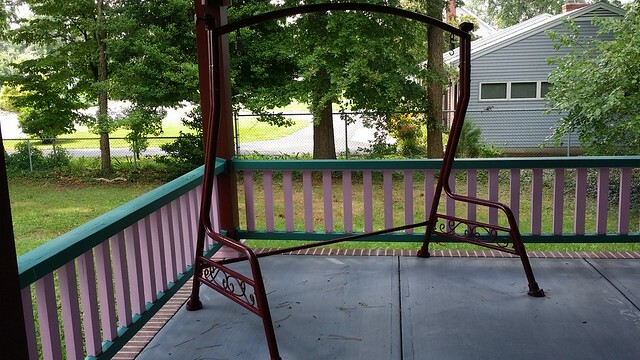 Then there was/IS the porch swing that I sanded and repainted, the summer the garage was finished. (Again, before I retired). All of it, except the swing part. I got distracted and the swing stands in the garage waiting. Maybe next week! If it ever quits raining! Oh, and those porch rails and pickets that I sanded and restained while the porch was being renovated…the top rails need some work again. Seems as though it is always something that is less fun than sewing! 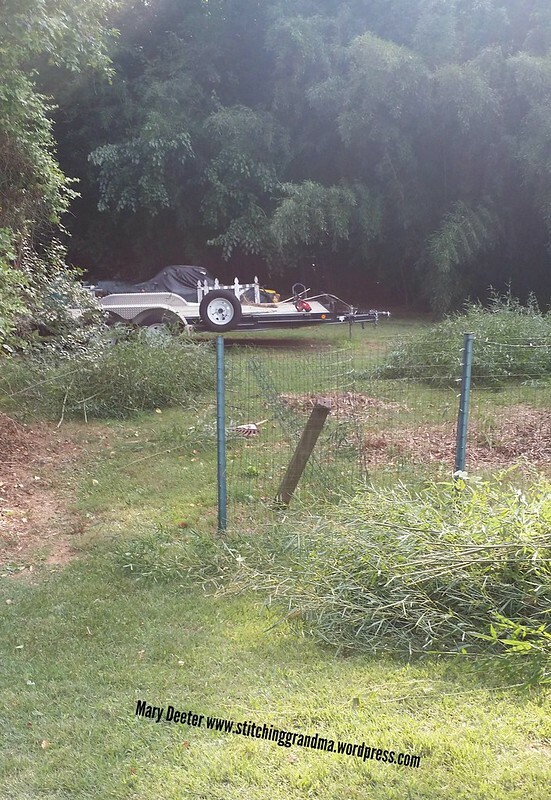 The garden…well…it is overgrown with weeds and it is simply to darn hot and humid to get out in it to weed. The ONE nice day we had last weekend was consumed by a yard work task. Hubby decided he wanted to tackle some of the overgrown stuff that had been neglected for 2 years. SO, I left my sewing room, donned my gloves and pitched in. We tackled brambles, and vines, and wild cherry trees, and BAMBOO. EVIL AWFUL TERRIBLE BAMBOO. Honestly, I would like to strangle the person who planted this crap decades ago. On our property, we have wisteria, privet, trumpet vine, honeysuckle and bamboo. One would be problem enough, but all of these run and have to be constantly taken down, cut out, trimmed back or they overtake the property. We have finally gotten the worst of the bamboo that ran along the property line under control when the neighbor started to work on “his side”. There are the odd bits out front but they are not anything like they used to be and an afternoon of cutting eliminates them. Out back, well that is another story. Behind our garage we have a big open gravel area that we had cleared when the garage was built. Then we have woods. About an acre and 1/2 of woods behind the garages. The bamboo has overtaken part of the woods to the point I don’t think we can do anything about it. We could cut everyday for the next month and not make a dent in it. Hubby had a nice bed of daylilies between the lawn and the back driveway that he enjoyed tending. Then, it too filled with bamboo, (while I was sewing one day I think) and he was overwhelmed. We really know it got out of hand during the 3 years where his back just would not allow him to do much more than mow the lawn, and I was sewing! So, this past Sunday afternoon, with my gloves on, he and I tackled that 4×15 foot bed cutting bamboo. We spent 4 hours! He was able to hold back the top of the stocks with the rake, while I worked with the big clippers cutting it off at the ground. Can I explain how my legs still hurt 3 days later. TOO much bending over at the waist!! He would pile it up in his cart and take it to his “spot” in the woods where he piles brush. Nature takes care of the composting and over the years, our cuttings have made great beds for the rabbits and the deer that frequent our back acres. Once all the cutting was finished, he uses his mulching mower and cuts away any stalks that stick out above the ground level, and mulches up all those “leaves” the bamboo has left behind. He has been working hard at finding the big runners that have crossed under his gravel driveway, digging them out. This little area we cleared doesn’t look like much, and he will spray it with ground clear for the next 2 years to kill off any other sprouts that might pop up. Then, and only then will he try to plant some grass back in the spot, and hope the bamboo doesn’t return. Yes, those are pile of cut bamboo stacked up in the foreground, and in the background all that you see is mostly bamboo, mixed in with the hardwood trees. We were hoping the tree canopy would prevent the bamboo from growing, but the bamboo just keeps getting taller and taller. Some of those stalks are 30 foot or more high. What a pain! NOW you can see why I was happy to escape back upstairs to my sewing room in the rain on Monday! Tuesday morning I took another long bike ride with my daughter and granddaughter. What a relief to escape the yard work! We got out early before the rain! We biked from 9 until noon, a total of 6 miles, with stops at the nature center to see the fish and at the playground to let the littlest person run off some energy. Much more fun than cutting bamboo. Don’t think the back of my legs was ready for another 4 hours of work in the yard. We have been bike riding now together 3 or 4 times, 6-8 miles each time. Turns out, I really enjoy the diversion, the exercise and of course, the company. Once a week has been our goal together. Of course, she is working on me to invest in a newer, lighter weight, more efficient bike. This antique I ride was her older sisters bike all thru school, and she is having her 20th class reunion this year. Maybe a 21st century bike is in order. Pondering….. Remember those placemats? Well, I made MORE. I got the 4 additional ones finished, and had my 12 I wanted. And then, well…just kept sewing. We are up to 18 now. I am starting to think about how to back them. Since these are totally scrap happy, I wonder if having a plain muslin back would make sense? I have LOTS of muslin thanks to Dottie L. at church. Going to consider that….while I prepare some “scraps of batting” for these. I was happy to use some of the batik scraps my friend Nancy B saved out for me to give some more bright colors to the last 6. I still have 6 blocks left and miles of batik strips, so I am certain there are more to be made. Maybe I will mix them all up, and dole them out in groups of 6 for gifts, and just keep the table runner for myself. I really have had fun playing in the batiks. (Much more fun than yardwork!) Off to the sewing room…..shhh…don’t tell the hubby the sun is shining! What are you doing for fun this summer??? Do you have some of those never ending tasks that you hate to work on?? How do you balance things? I’m bored….I must be feeling better! I’ve been cutting scraps for the last couple of weeks. I can’t focus on my projects because I have had a run of bronchitis and the cough syrup and meds make me fuzzy. I’m tired of being sick. I’m bored cutting scraps. I must be getting better! 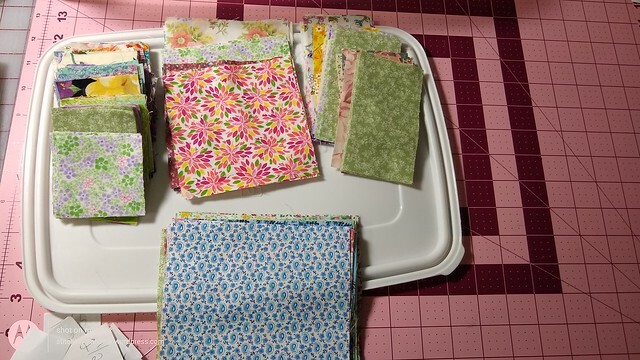 For the last 2 weeks, all I have managed to do is stand at the iron and press scraps, and stand at the cutting table and cut into my “scrap management” sizes. This was a much needed therapy from being stuck in the recliner too sick to care. Now, I am 3/4 of the way through the yellow tower of terror….down to the blue level, and only 2 more to go plus the basket on the floor underneath……progress…..
I’ve grown tired of fiddling with scraps. My string boxes (5 shoeboxes) were full. No place to put any more cut pieces. And my sewing machine is calling, loudly, to sew. 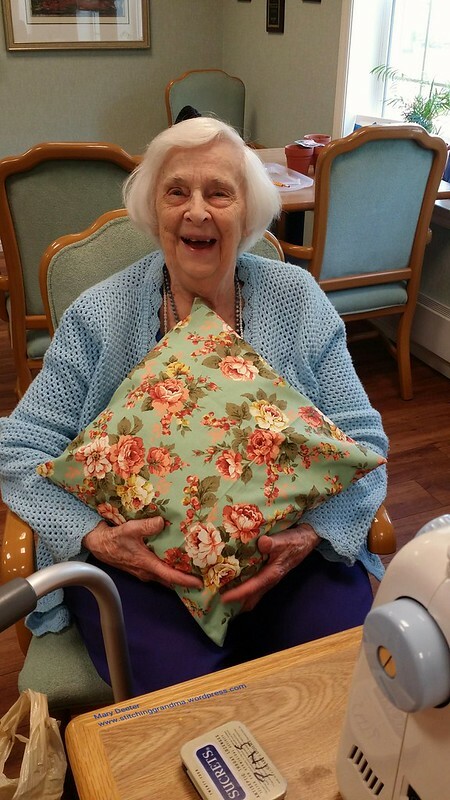 I can sit and sew for hours without expending a lot of energy. I MUST be getting better. It helps to just sit and stare out at the tree tops while I mindlessly sew. I grabbed an old phone book, and removed some pages, got out the paper cutter and cut 6.5″ squares, and just started to sew. Three days, and 3 or more bobbins later, I have a few string blocks. The bronchitis is better, still coughing, reduced meds, so less fuzzy headed. My sewing room is calling to me. I am getting better. SEWING IS THERAPY! I just need 1 more 6.5″ string block to bring the number up to 60. (Fuzzy brain miscounted when cutting the phone book papers……)(Oh heck, why not…I should make 100…..) Not sure what will happen to these pretty little blue blocks with their pops of purple. The will end up in a ziplock and I will add them to a charity quilt at some point. Now, back to the scrap management. I feel inspired to clear out the rest of the blues that are pressed and on the table waiting to be cut……projects await and my fuzzy brain is clearing. 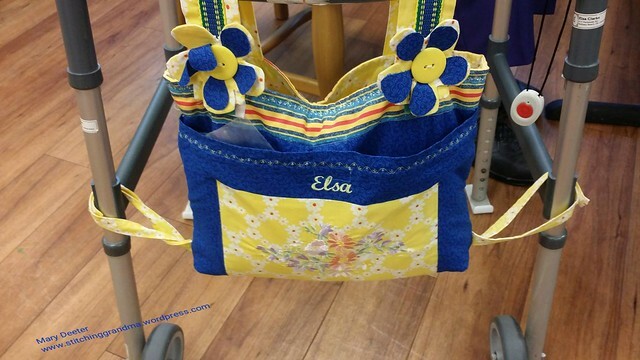 Do you do “mindless sewing” when you are bored? Linking up to Oh Scrap! today. I was not sure what was going to happen overnight, as they have been hyping the storm all day on Wednesday. Honestly, the effort to “scare you to death” is something. 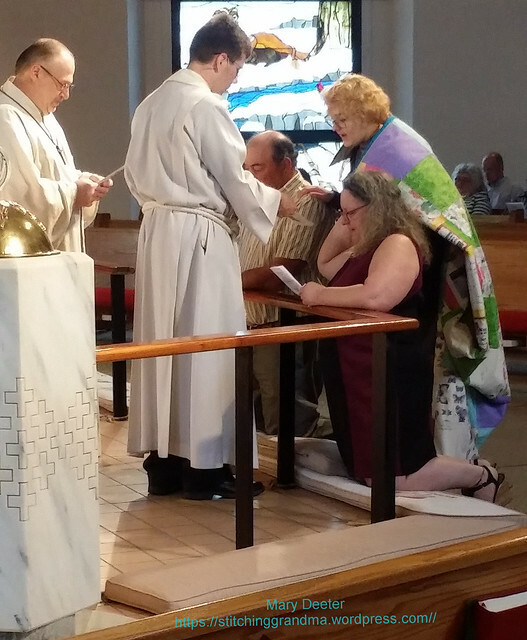 Anything to make noise….I mean news. I just know I am glad I am retired, and not making the 40+ mile commute to work! Not to bore you with snow photo’s but thought you might appreciate a bit of my morning. There didn’t seem to be much snow piling up out front, and I noticed the winds were whipping from North to South…so I went out to the laundry room for a peak out back. I think that is about 6″ of snow in the foreground on top of the hot tub. The roof of the porch along the garage has some interesting swirling snow. 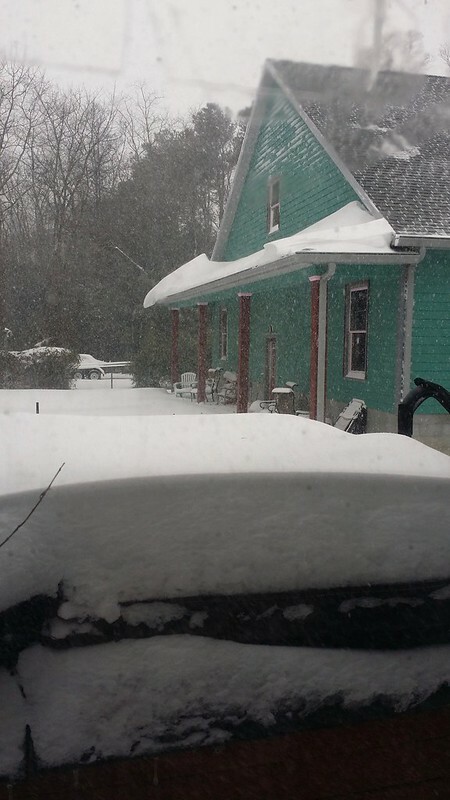 Note….my sewing room is “out there” on the 2nd floor of the detached garage….I think I am staying in today! I set aside the fabric for Block 18 the last time I was out working in my sewing room. I knew exactly what I wanted to do for this block with 4.5” corner squares. I had fun with block 18, fussy cutting the yellow fabric. I have used the pink and the yellow in other blocks previously. 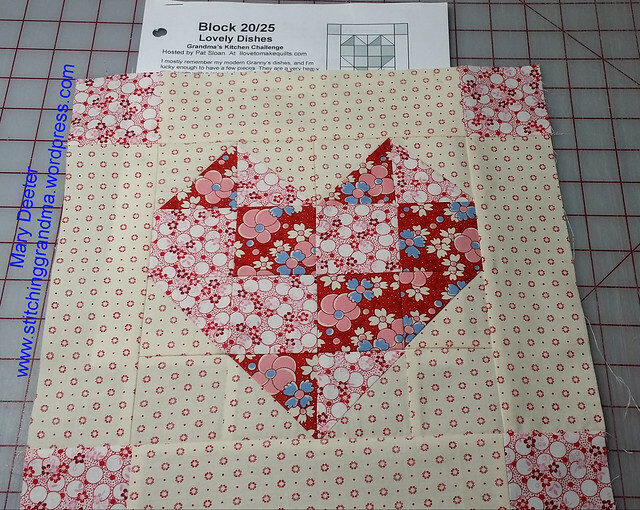 Block 20 just had to be made with reds! 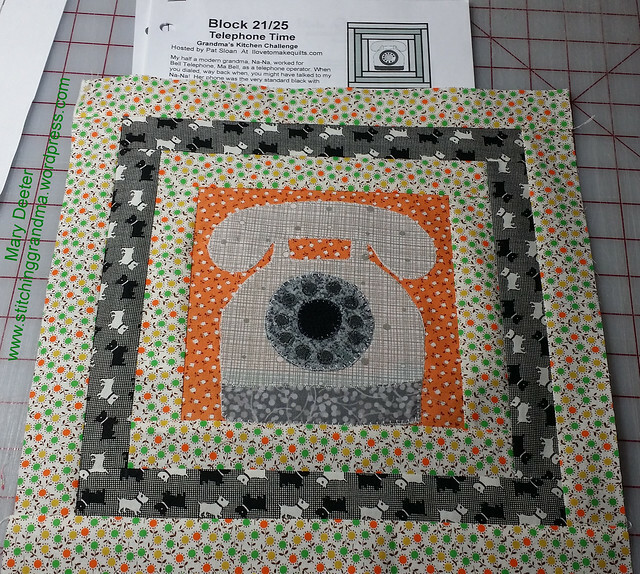 For Block 21, I dug in to a bag of scraps for the gray fabric, and actually in the leftovers from Addison’s quilt for the biggest part of the phone. (Ok, so they are not 30’s reproduction fabrics, but I needed gray!) The dial circles were cut from a piece of “very modern” dot fabric. Those dots were hard to applique stitch down. 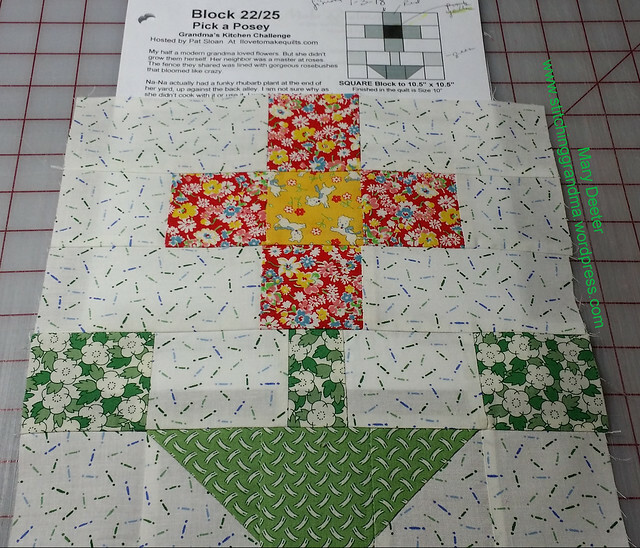 Block 22 wasn’t one that I felt excited about until I pulled the fabric. Now I am rather pleased. Just 3 more “feature blocks” and TONS of filler blocks to make. A fun project. I feel like I am catching up a little! More color balancing to do as I proceed. Are you on the East Coast of the USA getting hit with the storm? Don’t you think these silly names they give the storms “over hype” what is just a snow storm??? Working on anything fun today? Thank goodness for great heaters! Our lows are in the teens and highs in the mid 20’s for the next few days and the last few days. (Some weather person fibbed about it getting into the 30’s yesterday….NEVER happened!) (In case you are a new reader, my sewing space is above our detached garage. I share the space with my husband and his model train workshop area). Hubby has a massive propane heater downstairs and I cranked it up to 60 yesterday for a few hours just after lunch, and it really heated up the “floor” upstairs. While the hobby space warmed up we had a little “project” to assemble in the house. 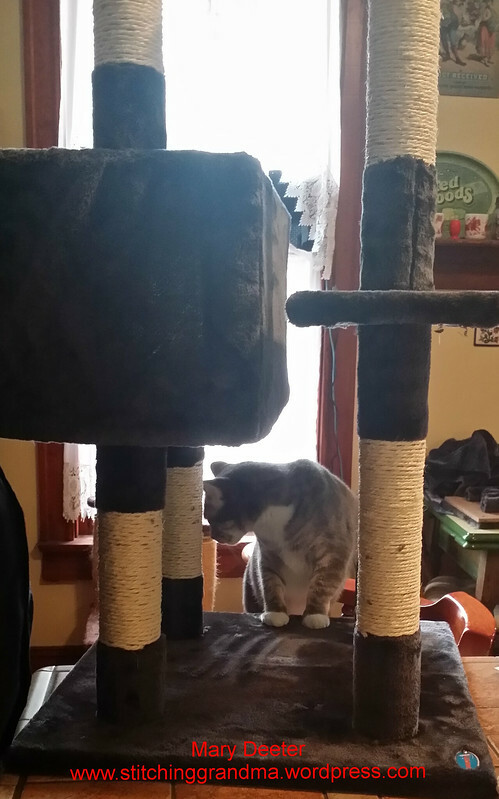 Fed Ex delivered the present I got our cats….and hubby had to figure out which part went where! He is the most curious cat of all and wants to be “in the middle” of anything you are doing! (He thinks he is helpful when I am trying to decorate the Christmas tree or dust the shelves). 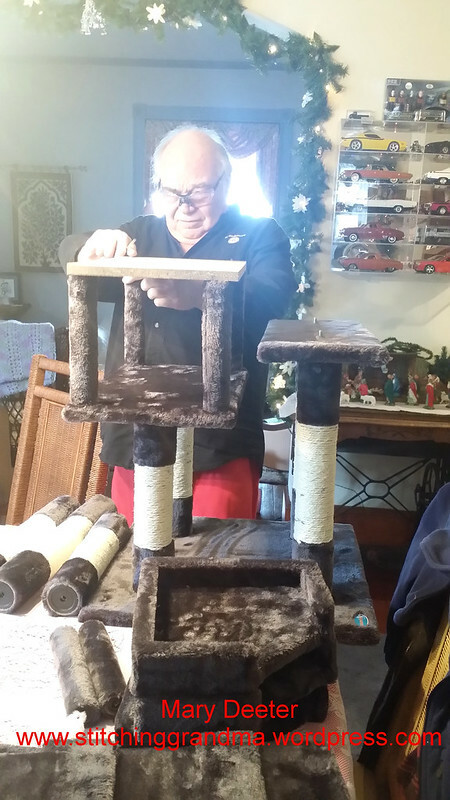 Once the assembly was complete…I spritzed a little catnip spray on the new cat climber, and both cats were quick to climb around….and roll around…and like the fuzzy fabric…. There are 4 of those dangling white mice hanging from the new unit on elastic cording. We are expecting them all to be pulled off in the next week or so. So far, only Smokey has been brave enough to climb to one of the higher perches. 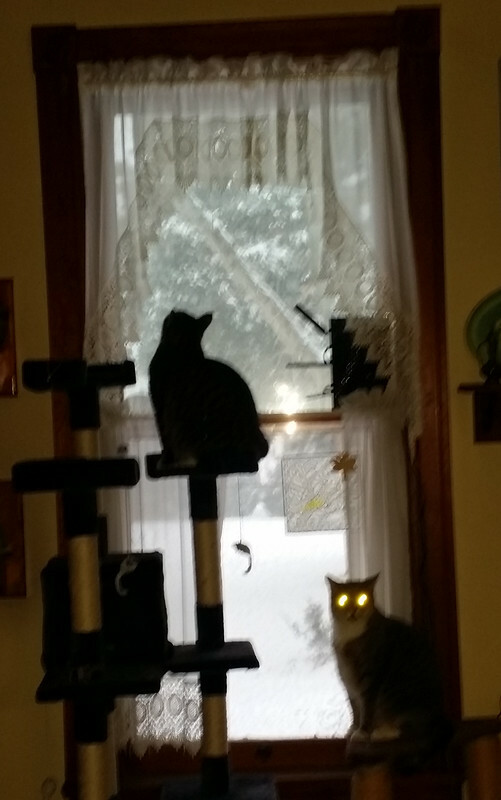 Once the cats figured out the new gift was for them, then we both ventured out to the garage to play. The temperature went from 55 degrees when I started the all the heaters, and before I was finished sewing for the evening it was 73, and I took off my sweatshirt! We hate to “stop” out in our hobby area once it warms up, so dinner was not until 8 pm last night. Hubby was working on a “turn table” for the model railroad at his train club, and I was having fun assembling the blocks to send to Carole. 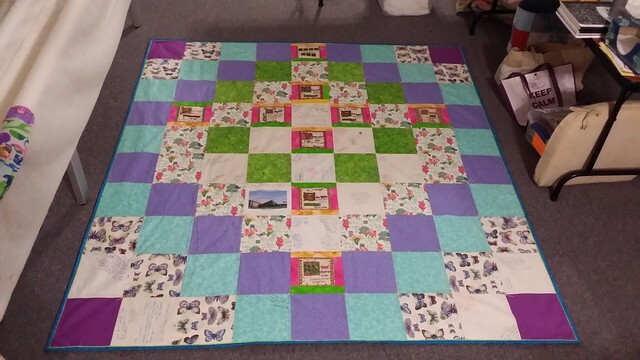 In my last post, California Thomas Fire Quilts Help Wanted , I shared with you information about making blocks for the victims of the fires out in California. I had 6 blocks finished in that post. I spent some “quality time” in my sewing room yesterday, and I now have 16 finished. All of the fabric came out of my scrap storage system. 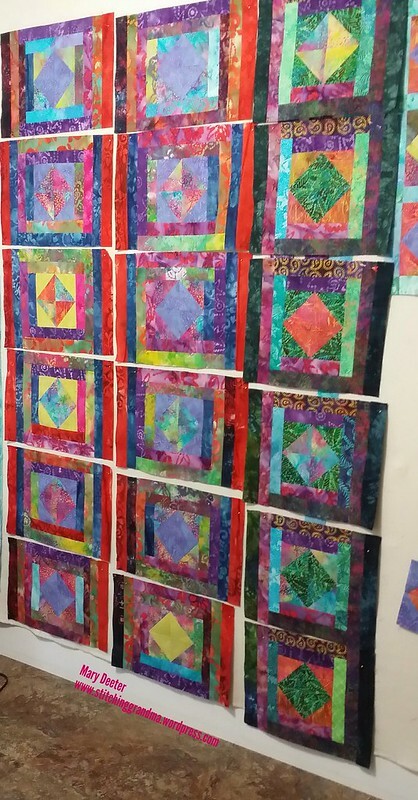 Many were already cut into 5″ squares. I did have to dig in the scrap bin of blues for those wonderful batiks, and in my neutral scrap box for the creams and off whites. So, there was some cutting involved as I prepped these blocks. Truth be told, I now have about 15 or 20 MORE batik and neutral half square triangles made, so I might see if I can put a few more together before these go out in the mail. I have some pretty floral fabrics that were part of a 5″ square collection that I made those coasters out of in my last post. What are your plans for “making” things this weekend?